Vipers Sports Club has maintained its stance on the availability of its players for the FUFA Drum which is set to kick off this weekend. Vipers SC patron, Dr. Lawrence Mulindwa on Friday, also adressed the circulating rumours that his club was against the tournament but rather indicated that their are so many issues that need to be addressed so as to have a good tournament. 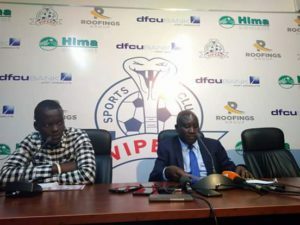 At a press conference held at St.Mary’s stadium on Friday, Mr. Mulindwa stressed that Vipers was part and partial of the passing of the FUFA Drum but feels there are issues that were not addressed before announcing the dates of the tournament..
“There have been rumors going on that we are not in support of the FUFA DRUM but I want to categorically state that as Vipers SC we are fully behind the initiative because we believe talent identification is very crucial, said the former FUFA president. “We were part of the FUFA assembly in September last year that passed the idea of the starting the tournament because we are members of FUFA and our thinking was that tapping into unearthed talent was important from across the entire country. However, the patron indicates that using already established players playing in the top tier does not make sense and that is why the Venoms wrote to the Federation indicating Vipers SC players will not feature in the tournament. “As Vipers SC, we do not believe our players and others in the top flight, if they play in such a tournament aimed at giving chance to the unknown makes value. “It leaves one wondering whether the cause is still talent identification or fans recruitment because you want to bring the established players. Additionally Mulindwa believes there are some key issues that have not been addressed before the players are summoned for instance availability and insurance. “The tournament comes at such a crucial tournament when every team needs their full squad because of the stiff competition in the league and the Uganda Cup. “I believe the timing could not have been any worse than it is. “Why not at the end of the season? He asked before adding, “Besides, what is the insurance of our players if they get injured in such games? “The scenario of Halid Lwaliwa is still fresh in our minds and he has been on the sidelines since May last year. “We have used a lot of money to make sure he returns to full fitness. SC Vipers defender Halid Lwaliwa was injured in the ‘Cranes Namutima’ which runs almost every after three months. It is also another project by FUFA aimed at taking the Cranes team as close as possible to the fans in an effort of creating a big bond between them. The patron was also disappointed that the Federation came out with threats, orders and ultimatums instead of looking at the dire concerns and seek ways on how to address them. “These rules don’t reflect sporting justice, Mulindwa continued. “Sending threatening documents and ultimatums, I don’t think it works. “Let’s not have rules and regulations to benefit individuals but rather the whole football fraternity. “We are well aware of the FUFA jurisdiction as the mother body and we respect that. “This thing of bringing politics can’t work – I can’t fight my kid, why should I? “They(FUFA) must know that clubs own these players and they have binding contracts,” Mulindwa added. This was in reply to the FUFA order that indicated all players summoned in respective provinces must show up lest they face suspension and their clubs will be docked points. We wait to see if Vipers players and those of other top flight clubs will turn out for the different provinces as summoned.